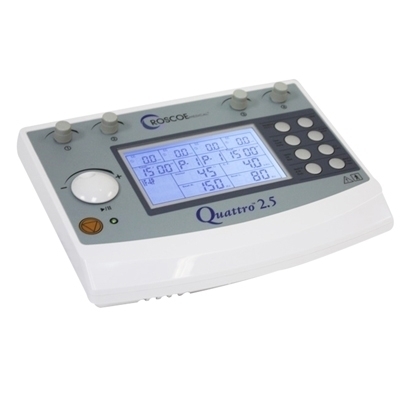 The microprocessor controlled Quattro II" is a professional four-channel electrotherapy device that provides IF 4-Pole, IF 2-Pole, Russian, EMS and TENS waveform. 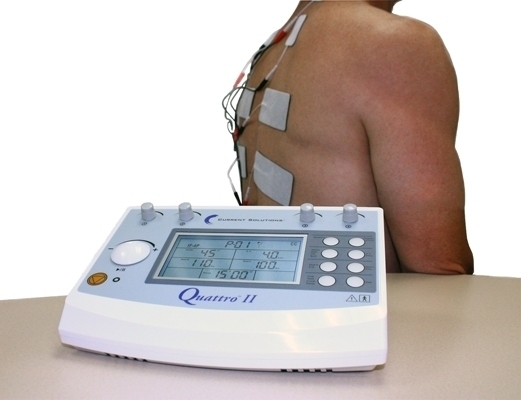 Four channels of electrical stimulation output. Large easy-to-read graphical LCD display with exact dial performance and programmable timer. Waveforms include TENS, EMS, 2-Pole Interferential, 4-Pole Interferential and Russian. 10 presets per waveform totaling 50 presets. User defined memory positions for user protocols. Designed for tabletop, therapy cart or mobile use. Includes eight sets of electrodes, eight sets of rubber electrodes with sponges, eight straps, four sets of lead wires and a user manual. Maximum treatment time of 60 minutes on all waveforms. Dimensions: 15.25" x 8.5" x 10.5"